Your headlights are your first line of defense when it comes to protecting yourself and your vehicle’s inhabitants from a potential accident while driving at night. Aside from being powerful tools that help you see in the dark, they also tell other drivers on the road where you are, contributing to a collective safety network of roadway luminosity. These days, headlight covers are typically manufactured from hard clear plastics, rather than glass. Over time, these headlight covers can yellow and cloud over, resulting in decreased effectiveness and not-so-appealing aesthetics. 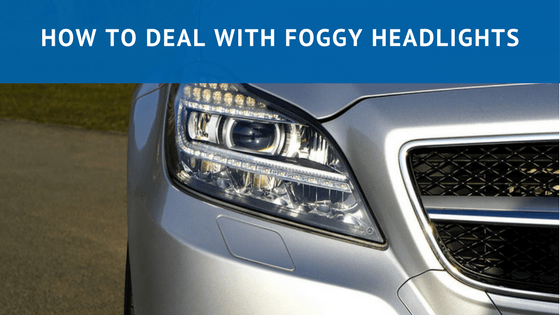 In this post, we’ll explain why our headlights oxidize, how it can be prevented with basic maintenance, and how you can treat and fix your already foggy headlights. Modern headlight covers are made from durable polycarbonate plastic, a naturally clear, amorphous and heat resistant thermoplastic. Polycarbonate plastic was chosen as a replacement for acrylic plastic headlight covers for its immense strength, useful in applications that require both transparency, and potential impact resistance traits. These poly lenses are prone to oxidation, as they also act as a natural UV filter. Oxidation occurs from prolonged exposure to air and sunlight that damages the exterior coating of the material, and manifests as a yellow cloud, or haze. General wear and tear from the road can also play a part in headlight deterioration. Gravel, dirt, stones and dust will chip, scratch and pit the headlight cover, accelerating the oxidation process. Water vapor and condensation inside the headlight can also affect the clarity and vividness of your lights – this is caused by trapped air and high moisture content that can diffuse and scatter the path of your lights onto the road. Luckily, polycarbonate plastic headlight lenses can be treated and prevented with some basic and regular maintenance efforts. All vehicle components wear down with age, and your headlights are no different – the advantage of preventative maintenance is that you can easily integrate it into a monthly, or semi-monthly routine. First, consider parking your vehicle out of the sun as much as possible. This will not only preserve the exterior coating of your headlight covers, but will also contribute to saving your vehicle’s paint job from oxidation and fade. Park it in a garage, or under the shade of a tree or building should the option present itself. Second to parking, a light polish can be easily applied to your headlights every few months to help remove the developing layer of oxidation. This polish should contain no grit or abrasive properties, and is only used to remove subtle yellowing from the clear coat on the polycarbonate lens cover. A polish that contains carnauba, for example, will help to protect the lens. Second, don’t underestimate the advantages of a good wash. Keeping your vehicle clean is always a good way to help protect the aesthetic and function of your headlights. A good automotive wash at least 4 times per year will help to prevent and remove any buildup of oxidation, acids, and grime that can contribute to foggy headlights. When regular maintenance isn’t enough to counteract the effects of headlight oxidation, have no fear – there are a few ways, both DIY and professional, that can help to breathe life back into your foggy headlights. Common baking soda and toothpaste can be effective restoration agents for foggy headlights. Both substances are abrasive enough to remove oxidation grit without damaging or scratching the clear coat underneath. A good store-bought polishing compound can also be a good entry-level headlight fix. The saving grace of most critically damaged and/or yellowing headlights are designated headlight restoration kits that are specifically designed to bring your headlight lenses back to life. These kits consist of a mildly abrasive polishing compound, microfiber cloth, fine grit sandpaper and a fixture to which you can attach to a drill or a motorized polisher. These kits are designed to remove yellow haze by buffing out the damaged layer of oxidation from the lens. First, clean the lens with water and an automotive soap to remove and excess dirt or road grime. Then apply a liberal amount of the headlight restoration polish and use the provided attachment to gently polish and remove the existing fogginess. Be especially careful – as you’re using an abrasive substance – to not gouge the deeper surface of the headlight lens. As you progressively polish, you will notice the yellow fog start to disappear. Simply rinse off the remaining cleanser with a brush or a clean rag, and polish until dry. Repeat on the other headlight! While we may neglect our headlights when compared to brakes, body repairs, and engine maintenance, the light they provide is the primary safety feature of any vehicle, and as such, deserves our attention every now and then. A bit of elbow grease, and an hour of polishing are all you typically need to restore your foggy headlights to a like-new appearance that will maximize the effectiveness of your lights when driving.